Content creation is the best way to increase search presence. How so? Websites with updated blogs have 434 percent more search engine-indexed pages than those that don’t. That’s 434 percent more opportunities to be found by online users searching for services you provide. But content creation is just one component of a high-powered content marketing program. Many marketers are relying on content syndication to elevate their content for greater visibility and link equity, not just for blogs but videos and graphics as well. Sadly, content syndication is often mismanaged or poorly informed. So what are the dos and don’ts of content syndication? How do marketers reap the rewards of such a publishing strategy? Explore every facet of syndication with this helpful guide. 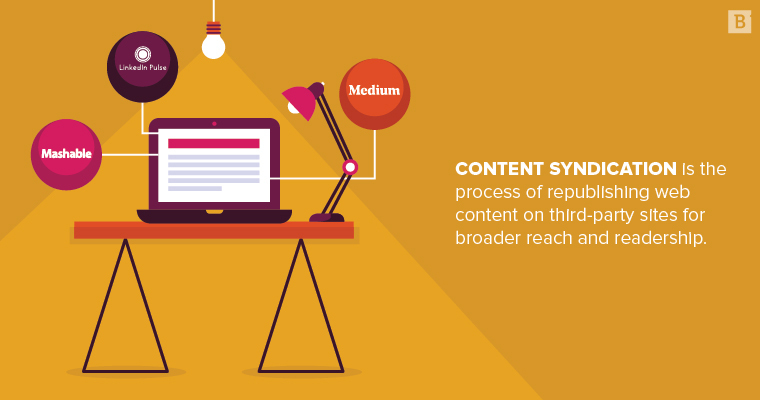 Content syndication is the process of republishing web content on third-party sites for broader reach and readership. A comprehensive article on your blog page can generate only so much traffic and search visibility. But that same post published through other outlets multiplies the number of eyeballs that scroll through your content. Content syndication exposes your marketing collateral to readers and viewers who may have never come across your brand organically. 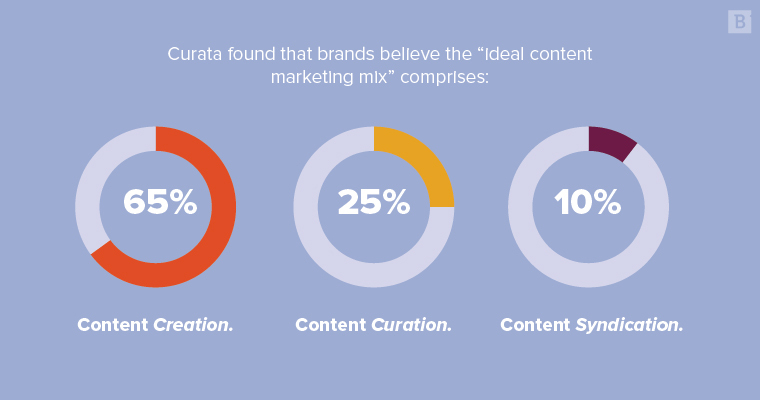 Original vs. curated vs. syndicated content: What’s the difference? Syndicated content isn’t an inherently distinct content format. It’s more so an individual avenue through the content marketing supply chain. Original content: Authentically created content courtesy of in-house producers or outsourced marketing partners. It’s unique and owned wholly by you. Syndicated content: Original content that can be solicited to other publications and published through agreed-upon channels. Common publishing opportunities for syndicated content are authoritative, industry platforms and print or digital magazines. In simpler terms, syndication is much less a differentiator on the content production side as it is on the promotion side. Additionally, syndication should not be confused with guest posting. Guest posts are often one-off opportunities for articles that are written to spec and published a single time on a single page. Syndication refers to republishing through external channels work that already exists on your own website (aka there will be two or more versions of the same content on the web. No, that’s not a problem, and you’ll learn why below). Access to a larger audience. Link authority and link equity. More information to factor into your buyer personas. Brand recognition and brand mentions. Content syndication allows smaller companies or those with fewer marketing resources to cast wider nets of readership. A single post on an established platform with hundreds of thousands of followers can greatly exceed the potential benefits of churning out new content and posting on your site alone. Syndication can also lead to future opportunities for consistent posting on similar platforms, whereby your content may begin to draw its own followers. Think of syndication as adding an extra boost (both in terms of SEO and promotion) to the content you’ve so carefully crafted or paid for. How do you syndicate content? At its root, content syndication rests upon the efforts of a marketing manager or similar person monitoring industry publications. More than anything, you need to know where the greatest upside lies. 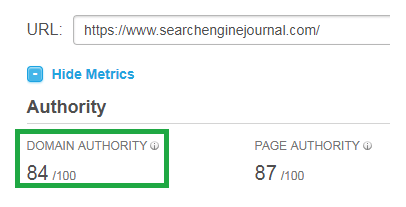 For example, in the content marketing space, syndicating with Search Engine Journal would be a great opportunity. It’s widely respected by other industry insiders, it’s referenced by marketers at large and it’s a consistent source for authoritative perspectives. Above all, its Domain Authority is 84. Brafton’s is 58. You’re darn right we’d love high-quality traffic routing from SEJ to Brafton – that’s equity that can drive up our own Domain Authority over time. 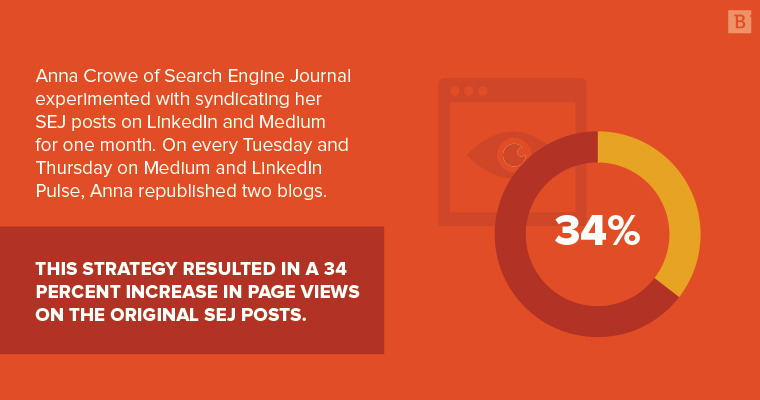 Anna Crowe of Search Engine Journal experimented with syndicating her SEJ posts on LinkedIn and Medium for one month. On every Tuesday and Thursday on Medium and LinkedIn Pulse, Anna republished two blogs. This strategy resulted in a 34 percent increase in page views on the original SEJ posts. Shares, reads and comments likewise rose. Observe publications your target audience reads. Reach out to those sources regarding publishing opportunities. Determine timing, bylines and guidelines (establishing a strict contract is key). 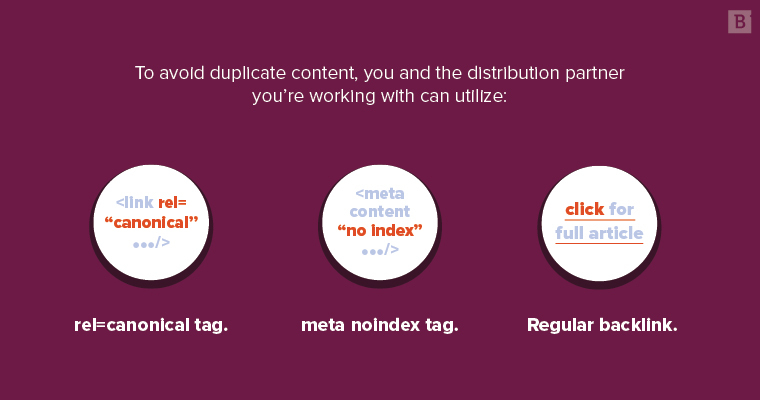 Set up proper tags to avoid duplicate content penalties (not an official penalty – see below). Repeat with additional publications if successful. Lastly, self-syndication services remove all barriers of entry (e.g., Medium) so you are free to post whatever and whenever you want while ensuring all syndication best practices are followed. Doesn’t republishing content elsewhere on the web lead to duplicate content? This is where an adroit marketer or web manager comes into play. Syndicated content can easily be SEO-friendly content with various indexing tags. Technically, Google doesn’t penalize you, per se, for duplicate content; it just selects which version of a web page is algorithmically superior and serves it to users, meaning the inferior version dies in a black hole. In this manner, a figurative penalty does exist. rel=canonical tag: This tag should be set up on the page that features the republished content (the syndicated page). So, all ranking signals are effectively diverted to your original page and Google knows to feature yours, not the duplicate. meta noindex tag: Essentially the same thing as a rel=canonical tag, except that it fully removes the noindex page (the syndicated page) from indexing altogether – aka yours is the only one that officially exists on the record. Since syndication expands social presence, followers and subscribers will have more information on your brand to share. Regular backlink: This is the least-desired and perhaps least-effective option, but it’s one that may be most conducive to marketers and distributors who aren’t savvy coders or have very strict code implementation standards. In this case, your original post would be backlinked to (and that’s it), which means it’s probably best to allow only a snippet of your post to be syndicated, ensuring that readers will have to click on your link to access the full post. Google will be able to ascertain who owns the original post and who should be featured in SERPs. But, as stated, the safest way to have complete confidence in circumventing duplicate content is to opt for a rel=canonical or meta noindex tag. Be sure to have written confirmation of these tags from your distributor as well, as they should be non-negotiable in most circumstances. Content syndication isn’t a process to be completed singlehandedly. Several platforms contain networks of publication opportunities all in a single repository, and they can take your content straight to distributors and post for you. Great, right? Of course. BUT. Some sites like Taboola and Outbrain charge you per click and they rely on overly clickbait headlines to generate those clicks. The problem is that these headlines don’t actually match the content, which produces astronomically high bounce rates – the opposite of what you want. Further, some syndication platforms have amazing reach because of their popularity. You don’t need to place your entire syndication strategy in the hands of these sites, but it can still be great to gain that level of exposure. Manual outreach of targeted publications may be more time-intensive, but they’re likely to lead to higher quality results. Relying on paid services may be too costly and not helpful enough, so buyer beware. There are a number of content types to syndicate, but the good ol’ blog is usually suspect No. 1. That’s why RSS aggregators, specifically, exist. RSS refers to “Really Simple Syndication.” It is a short piece of XML code that is installed on a site (WordPress has a built-in plugin for this) that signals to readers that you encourage your content to be syndicated and distributed across other platforms. Readers can also subscribe to your RSS feed and be notified when you post again. Syndication tools like Alltop and FeedListing are RSS directories, syndication platforms that marketers submit their RSS feeds to for automatic republishing. RSS aggregators do much of the dirty work for you, since with just a few clicks you can quickly disseminate your content all over the web (in addition to having it originally live on your dedicated blog page). That said, RSS feeds are less common than they were in the early- and mid-2000s. More recently, social media platforms like Twitter and Facebook serve a similar RSS purpose, as users can configure their timelines to view only the content they want to see, along with enjoying the more diverse types of content and commentary that occurs on social media. This fact has, in essence, sidelined more traditional RSS feed usage. Content syndication is really only valuable if the distributors posting your content are relevant to your prospects. Prospects not big on Facebook? Don’t syndicate there. Do they comment often on industry-specific forums or publications? DO post there. Embrace syndication tools and sites that are reputable and popular. Target sites that are highly relevant to your industry. Use social platforms like LinkedIn. Pitch to sites that accept submissions, like Huffington Post and Business Insider. Use free sites if possible. Work with tools or sites that have sleazy pay or reward structures. Syndicate content without contractual language regarding SEO practices. Overdo it. Distribution is one sliver of content marketing, so networking with every distributor you can find is likely inefficient. Limit original content creation for the sake of content distribution. With this barometer in mind, it’s clear that content syndication is by no means a tactic that should spearhead your marketing efforts. It should be in the discussion but only after creation or curation has already been properly resourced and planned out. If you’re not seeing any movements advancing these metrics, move on and try something else. It’s these qualities that readers will pick up on, and they will help your original content rank higher in search while simultaneously matching the audience intent of the sites you syndicate on. You’ve got the tools, the facts and the recommendations. Syndicate until your heart’s content, or at least until the results validate your strategy.